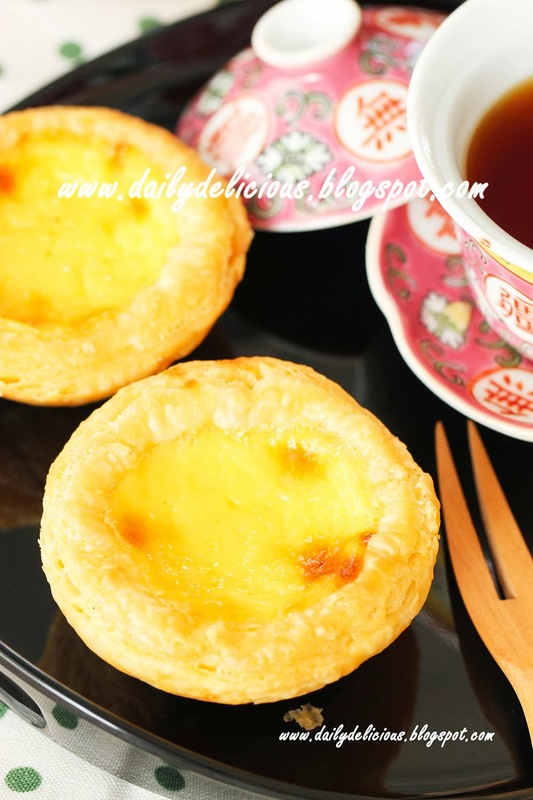 dailydelicious: Chinese Egg Tarts: Delicious little tarts! Making many kinds of dessert, bread, cake or etc., is fun for me. There are so many thing in this world that I never made it before, and many things that I still can't master, haha. But I don't want to stress myself, baking at home doesn't mean that you have to be the master chef! You have a chance to try something new and if it doesn't turn out well, you just make it again and again (if you want to, hehe). This is one of the recipes that I tried to make it, and it didn't turn out well, until this time, ^^. 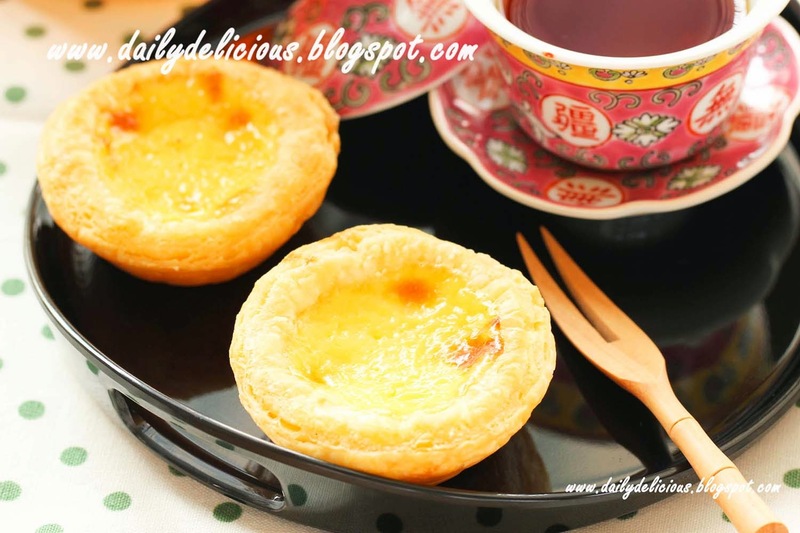 "Chinese egg tart", a little tart made from puff pastry and custard filling, sounded simple. I didn't want to say that it's hard to make, the point is I already made the mistake before. For this tart you don't have to make a perfect multi layers puff pastry, this quick puff pastry give the tart enough crispiness and puffiness (and it's easy to make too). But the most important thing is the filling, I tried recipes with a lot of yolks, a lot of cream etc., but it turn out to be thin and overflow every times that I bake. This time I try cooked cornstarch then mix with other ingredients before baking, and yes it's the right answer, it makes the filling firm enough to stay in place, so you get thick, rich and delicious custard filling. 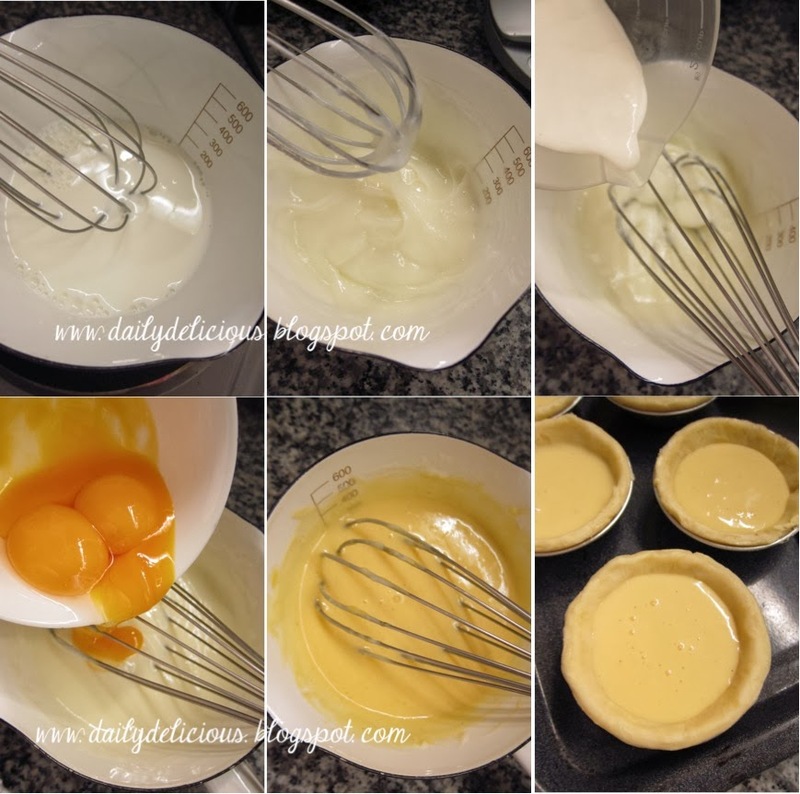 When pouring the custard into the pastry, don't try to fill it too much (I made this mistake before), because the filling will overflow when baking. Using high heat gives both color and quickly set the filling too. The quick puff pastry will be a bit more than you need for this recipe, you can keep it for other recipe. Now, let go to bake this little delicious tart together, I'm so happy that finally I can share this recipe with you. Put all purpose flour with salt into the food processor, process for 30 seconds to combine. Put the butter into the food processor bowl, process until the butter turn into small pieces (don't worry if there are some large pieces). Pour the water into the bowl, process until the dough started to form. Dust the table (or work surface) with flour, press the dough (use your hand) into 18x30cm. Fold the top and bottom into the center (like a letter), then press the dough into 18x30cm. again. Roll the dough, (from a short side (18cm)), then press it lightly. 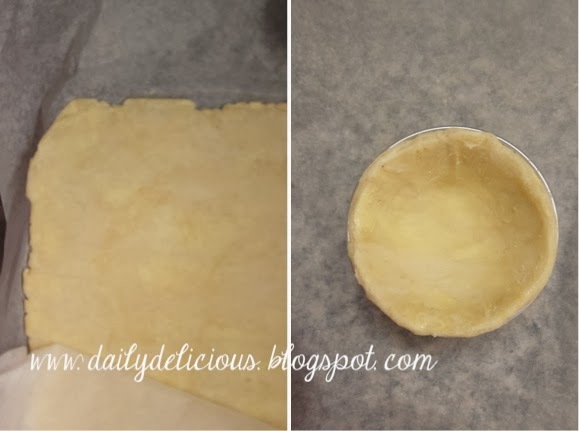 Cover the pastry with plastic warp and refrigerate for 1.30 hours. 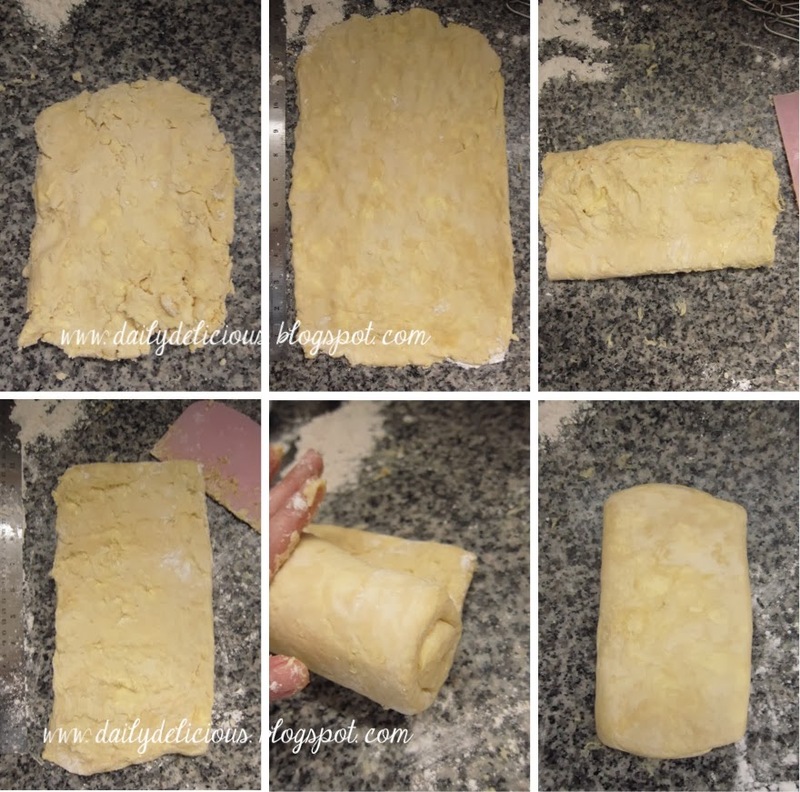 Roll the pastry into 3-4mm thickness, if the pastry is melt return to the fridge, you need to keep it cool ^^. 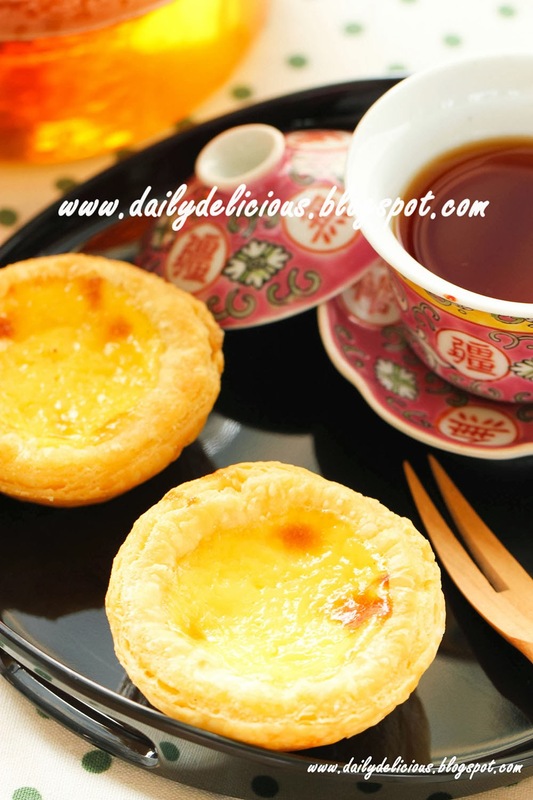 Cut into 9cm round, and press into the egg tart molds. Meanwhile preheat the oven to 250°C . Mix sugar, cornstarch and milk together in a saucepan, whisk to combine. Place the saucepan over medium heat, heat until thicken (stir time to time, to prevent burning). Remove the saucepan from the heat, pour the whipping cream into the saucepan, whisk to combine. Add the egg yolks, vanilla extract, lemon extract (if using), and salt, whisk to combine. Pour into the prepared pastry, about 7/10 of the pastry. Bake in 250°C oven for 10 minutes, then lower to 200°C the heat and bake for 5-7 minutes more. I just add the amount, you need 3 yolks for this recipe. 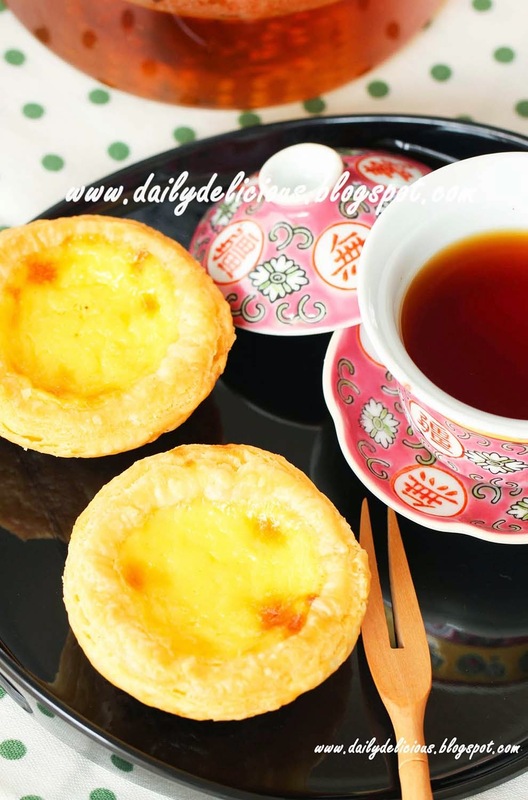 Awesome egg tarts. I've never attempt to make my own puff pastry, always use store-bought ones. 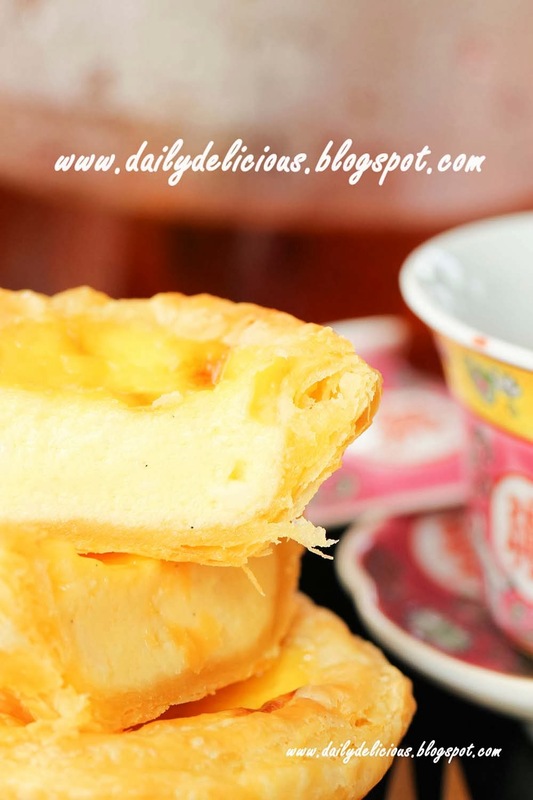 Your pastry looks very nice, thanks for sharing on how to make puff pastry. Do we have to turn the dough after we fold it into a letter? You need to roll it from the short side after folding it into a letter ^^.